Rudolph grew up as a farming child in Schivelbein, Germany. His extreme interest in natural science and humanistic training carried him through school. In 1839 he received a scholarship from the Berlin military academy of Prussia where he was offered to study medicine. Now instead of going off to join the military, he went on to work as an assistant for Robert Froriep, who was a professor at the Berlin Charité . With the help of Froriep, Rudolf became a professor in 1847. Two years after his promotion to professor, he left for Würzburg where he decided to then study anatomy. In 1856 he returned to Berlin with the title anatomic pathology professor. 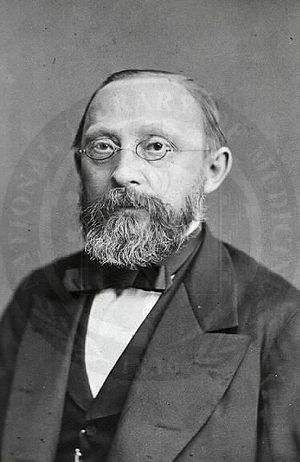 Virchow was eager to work and therefore accepted jobs from both Berlin University and the Berlin Charité (where he previously worked in his early age). There he taught many other famous scientists such as Edwin Klebs, Ernst Haeckel, and Adolf Kussmaul. He made a huge impact on the study of medical education for Germany. He often encouraged his students to use microscopes and 'think microscopically.' In 1856 he accepted an invitation to become the director of the new Pathological Institute. There as a director, he resumed his work with the German medical community. He pointed out the value of clinical observation and experimentation, and proved the "speculative" methods of early years. He stated that "life was the sum of physical and chemical actions and essentially the expression of cell activity." Some later years he was appointed professor at the University of Wurzburg where shortly after he married the leading German gynecologist's daughter, Rose Mayer. While working at Wurzburg he and his students' accomplishments were recognized and the school was known as one of the best in Europe. In the late 1860's to early 1870's Virchows attention was only on anthropology and international medical relations. He took part in many international medical congresses during this time and interest in the control and prevention of epidemics. He started many books such as "Virchow's jahresberichts", and the "Handbook of special pathology and therapeutics" which he edited until his death. Virchow had many great discoveries. In many of his speeches he stated that advanced research could be done if the doctors were willing to take science to the next level. This included making clinical observations, performing animal experimentations, and studying microscopic pathological anatomy. He believed that movement would help the German medical community to shift away from being a largely theoretical activity. As a well known scientist, he was the first person to recognize leukemia. He was also the first person to explain the mechanism of pulmonary thromboembolism.He documented that blood clots in the artery originate from the venous thrombi. He stated "The detachment of larger or smaller fragments from the end of the softening thrombus which are carried along by the current of blood and driven into remote vessels. This gives rise to the very frequent process on which I have bestowed the name of Embolia." His greatest accomplishment however was both making and discovering the 'Omnis cellula e cellula', which means 'every cell originates from another cell.' He made this discovery by observing that not a whole organism gets sick but only certain cells or groups of cells get sick. Virchow then made a triad factor that helped to describe the venous thrombosis. He named this discovery the Virchow's triad. With this new discovery he then made many new conclusions with the following: cellular pathology, comparative pathology (comparison of diseases common to humans and animals) and anthropology. Virchow fought with the germ theory created by Louis Pasteur. Rudolf stated that a diseased tissue was caused by a breakdown of order within cells and not from an invasion of a foreign body. Today scientists have discovered that diseases can be caused by both statements. In 1848 a typhus epidemic occurred and he was offered to conduct experiments on it. The experiments resulted with a sweeping educational and economic reform and political freedom argument. He stated that in order to do any work for the sick, he must treat the sick society. Putting this to use he fought and became a member of the Berlin Democratic Congress. During his last years he conducted a study where he worked on both physical anthropology and physical characteristics. He did this by performing a racial survey of German schoolchildren. His results stated that there was no one race to German, but in fact a large mixture of different types they were all just simply organized into one social or political system. In the 1870's he took part in an archaeological influence that led to a role as co-founder of the German Anthropological Society in 1869. Virchow also took part in many campaigns against the Catholic Church, for he was a Protestant and proud of it. This page was last modified on 11 July 2011, at 13:02.